Based on a Dutch program, this reality show follows a group of 14 pioneering everyday people (chosen out of more than 5,000 applicants) who say goodbye to the lives they’ve known for a year. They move to a remote location with limited supplies, diverse backgrounds, and zero bathrooms. They have to figure out how to survive and create their own society. The series is scheduled to be shown twice a week but live streams are available for viewing online 24 hours a day, seven days a week thanks to 129 cameras planted throughout the Utopia compound. Each month, three pioneers who are considered to be dispensable are nominated and could be banished (sent back to the outside world). The home audience will have a chance to vote for which candidates get to take their place. First aired: October 31, 2014. What do you think? Do you like the Utopia TV show? Do you think it should have been cancelled or kept on the air? 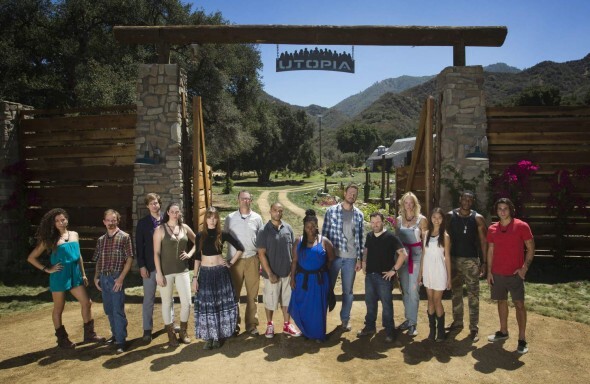 Utopia: New FOX TV Show; Cancel or Keep It? My wife and I didn’t mind the show. Had to grow on us a bit. would have enjoyed playing it out for longer than one season. Glad it was cancelled. It was TERRIBLE. Very boring. If you do this again, please get some people with brains – then it might actually be interesting to watch. Fox cancelled all the good shows. Utopia, Red Band Society, and Resurrection. Whats going on? I personally I liked the show. I’m mad it was cancelled. You could have at least finish the experiment. I’m with Sandra.. You could have finished it… ONLINE if nothing else!